Think back... way back to the spring when I first posted two WIPS of poured paintings of mussel shells. I completed one and let the other, well rest. Somehow, once I get to about the first third of a painting I seem to set it aside and then finish an earlier piece. this time is no exception. With Maritime Blues II recently back from the framer, I decided it was time to finish this piece. What I love about this painting is I can pick it up at any time, work for a few hours and them come back to it. I have a goal to complete at least two shells pre day until I can call it finished! 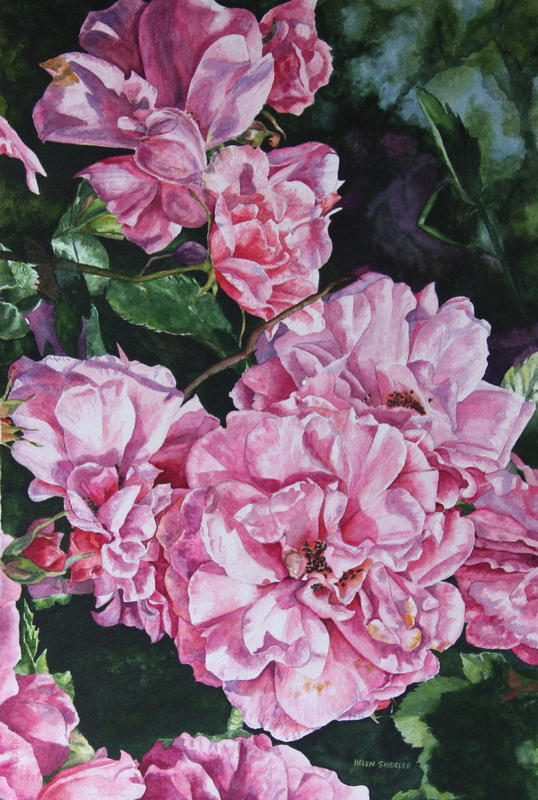 I am loving the colours and textures - feeling quite adventurous with all the mauves and bits of pink. This photo is showing the work darker than it really is - I will shoot the next update in better light! Think I am finally getting back in the grove. I have an inordinate number of works in progress. All in various stages. And I finally just completed this one! These roses grow on my friend Jeannie farm. They are well fertilized with well composted horse manure. The roses are spectacular because of it!. I hunkered down for a few days... armed with opera rose, rose madder genuine, potters pink cerulean blue, and various shades of red in including scarlet and magenta. Armed with green gold, olive green, perylene green and sap green I began this painting adventure. Although the lily pads took a lot of concentration - they were fun to paint. Monochromatic. But fun none the less. The little leopard frogs were trickier to scketch in than they were to paint. Almost my favourite bits of painting are the tiny little bugs. I had to take my glasses off to work on them. The work in progress post is just below! And so, countless hours, untold amounts of staring and figuring and color balancing... I think this painting is finally done! I knew today that it was in my reach to finish this piece. I hunkered down at 8am and just finished it at 7pm. I spent a lot of time deleloping the foliage. After I thought I was all done - I looked at it with squinty eyes and realized that I had to deepen the colors of the leaves. I went back in with a wash of terre vert (a blueish green) and intensified the leaves. And then once again thought I was finished. Then I looked at it again with squinty eyes. Saw a number of the rose petal has to be deepened and some of them needed a boost of personality (more colors). I looked at it again and thought I was finsihed. Then I realised the tiny fly had no legs or antennae. I fixed up the bug and hung the painting on my fridge - yes my fridge. And am determined no more squinty eyes. I am declaring this painting finsihed. At least until tomorrow when I look at it with fresh eyes. When I get to this stage in a painting - I often wonder "what am I thinking?". Seems like I have been working on this piece forever. Don't get me wrong.. I love the complexity and all the detail. It is just at this point I am getting excited for the next painting - without any shade of pink. Have I mentioned that each petal takes at least an hour to complete? This painting will require at least three more sessions to complete. My favourite stage is when I look at the work and start to balance the colours - a little bit more colour here - and little more darks in there. This really makes the painting pop. I have my next painting sketched out - actually I have three more sketched out - two more watercolors and one in oil. May have something to do with my anxiousness to complete this. Finally finished the large Lilac painting! Phew! This was no small undertaking. I have been working on this piece for what seems like forever and a day. What makes this piece interesting is that the more you look at it, the more dimentional it becomes! I went through more paint imaginable on this - I guess this is typical of large works. Always makes me marvel though. Watercolours are seemilgly endless in thier supply until you take on a full sheet. I am ready to retire the mauves... for at least another painting or three. I have already started an iris - shades of ivory, burgundy and a little bit of mauve. This painting is a full sheet transparent watercolour of lollypop lilies from my garden. This is one of my favourite flowers. I love the cranberry tips on the petals and the subtle ivory/white shades of this lily and the way the sun spots create litle highlights. This painting took a very long time to complete.